WASHINGTON — After a few weeks without government shutdown talk on Capitol Hill, congressional leaders face another looming deadline to pass a new budget resolution or risk another series of department programs temporarily shuttering. The budget agreement worked out by lawmakers in February extended federal spending until March 23, but this time with the framework for a larger plan to fully fund government agencies until the end of the fiscal year (and through fiscal 2019 as well). Now, in between a host of hearings on the budget for next year, lawmakers will be working out the details for the current one as well. That includes inserting provisions favored by defense lawmakers to give the Pentagon more flexibility to spend the new funding, given that the current fiscal year only has six months left. Top officials from each of the five armed services and the Department of Veterans Affairs will be on Capitol Hill throughout the week to discuss those issues, with at least 18 military and veterans budget hearings scheduled over three days. Committee members will host a field hearing with local officials to discuss the available VA health care options in Puerto Rico and challenges looking ahead. 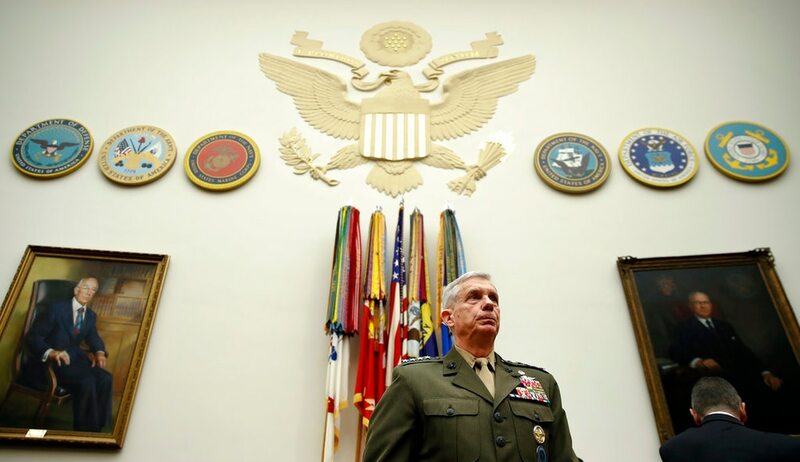 Gen. Thomas Waldhauser, head of U.S. Africa Command, and Gen. Joseph Votel, head of U.S. Central Command, will brief the committee on their budget requests for fiscal 2019. The heads of each of the services’ cyberspace missions will testify before the committee on looming challenges and the fiscal 2019 budget request. Former British Prime Minister David Cameron, who currently chairs the Commission on State Fragility, Growth and Development, will testify before the committee on policy priorities for developing nations. Air Force Secretary Heather Wilson and Air Force Chief of Staff Gen. David Goldfein will testify before the committee on the fiscal 2019 budget request. The two committees will hear legislative priorities from 10 veterans groups, including the Air Force Sergeants Association, Fleet Reserve Association, Military Officers Association of America and Military Order of the Purple Heart. Outside experts will testify before the committee on Somalia's current security and stability status. Outside experts will testify before the committee on current military policies on space warfighting and security. Service officials will testify before the committee on the fiscal 2019 budget request. William Roper, assistant secretary of the Air Force for acquisition, and other service officials will testify before the committee on projection forces and the fiscal 2019 budget request. Lisa Gordon-Hagerty, under secretary for nuclear security at the Department Of Energy, and other officials will testify before the committee on the fiscal 2019 budget request. Steve Walker, director of the Defense Advanced Research Projects Agency, and research officials from the services will testify before the committee on the fiscal 2019 budget request. Adm. Harry Harris Jr., head of U.S. Pacific Command, will testify before the committee on current threats in the region and the fiscal 2019 budget request. The committee will consider four bills, including one to limit assistance to areas controlled by the government of Syria. Veterans groups will testify before the committee on veterans health care issues and the fiscal 2019 budget request. VA Secretary David Shulkin will testify before the committee on the fiscal 2019 budget request for his department. Secretary of State Rex Tillerson will testify before the committee on the fiscal 2019 budget request. Gen. Curtis Scaparrotti, head of U.S. European Command, will testify before the committee on security challenges in Europe and the threats posed by Russia. Officials from the Veterans Benefits Administration will testify before the committee on the fiscal 2019 budget request. Air Force officials will testify before the committee on intelligence, surveillance and reconnaissance programs and the fiscal 2019 budget request. Gen. John Raymond, head of Air Force Space Command, and other defense officials will testify before the committee on the fiscal 2019 budget request for national security space programs.